Well today was going to be one of those ‘do nothing’ days. Yeah right,….. took a look at the porcelain skirting board that’s been lurking in a corner of the kitchen since those nice Italians sent it over from…… Italy. 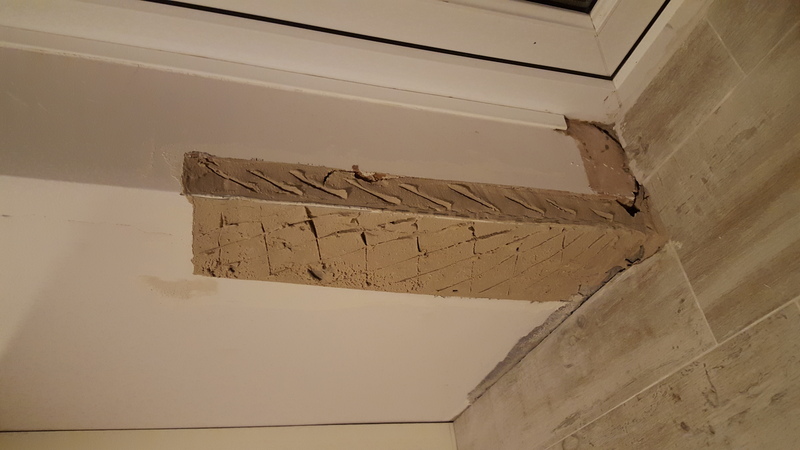 Offered it up to the wall by the side of the kitchen units and came to the conclusion that the wall had such a bend on it that there was no way that the skirting was going to sit straight. So out with the hammer and bolster and removed the entire corner of the wall back to a straight edge. What they were thinking when they plastered this, god only knows…. Whizzed down to Wickes and availed myself of a small bag of rough plaster. Mixed it up and sorted out the wall. Going to skim a final coat on tomorrow and then paint the walls again. Also took the the door jamb off so that I could make the sliding door a bit smoother in operation. I spent hours doing this when I installed the new door but for some reason it had moved an bit on the runners and was binding very slightly. Sorted that and filled and painted the jamb where I removed it.